Only a few days ago I wrote “Russian demands are quite simple. Ukraine will never join NATO. Ukraine will not join the EU. 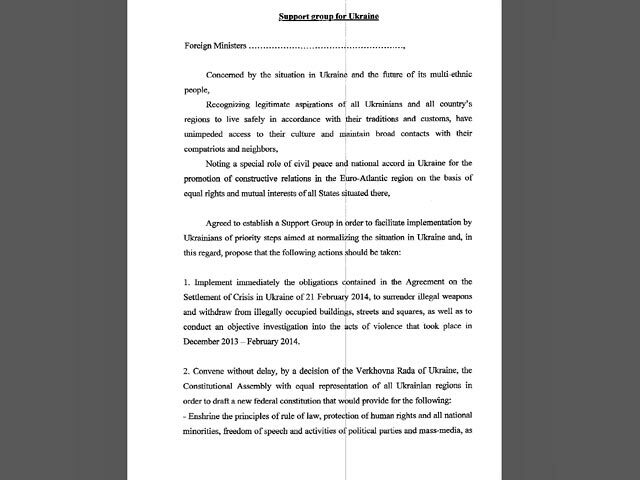 Ukraine will not sign the agreements with the EU as they are currently written. Of course I didn’t actually know for certain what the Russian position was – but it did seem pretty clear to me, as what I wrote implied by far the best way to control Ukraine without having to run it – or overrun it. In fact, I was not that far off. Russian demands are Ukraine will never join the EU, or NATO, Russian will become an official language of State with Ukrainian, Crimea is Russian and the federalisation of the nation must be constitutionally established – federalisation for the reasons I stated above no doubt. Stupid of me not to consider the Russian language as an opening position – it is the easiest to give up by way of diplomatic compromise. I was right on all the rest though. Naturally nobody is going to go for the Russian solution “as is” – but – a way out of this mess now begins to become clearer. 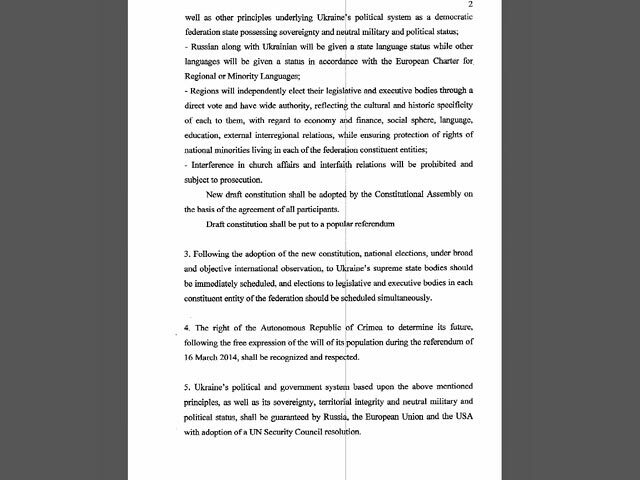 End solutions may now realistically include a Ukrainian constitution that clearly states and assures neutrality militarily and politically – namely no block membership east or west – that neutrality acknowledged and guaranteed by all on the UN Security Council without fear of veto as all needs of all parties are met – if not their opening positions or all of their interests. The other points are not intractable – but Russian fears – and possibly EU fears regarding eventual Ukrainian membership – would be eased by such a “neutrality solution”. Herein is the key. Thereafter the Russians would probably agree to the retention of the existing language laws allowing for regional preferences to run along side the Ukrainian State language rather than scupper the above by insisting upon equal language status – Russian minority rights already assured. Some form of local government legislation very close to – but not quite – the formal federalisation of Ukraine created – for example allowing for 50% of tax revenue to remain local, enhanced local legislative ability etc., in exchange for formal federalisation as desired by Russia is something that could be accommodated if the interlocutors of both Ukraine and the west (especially the west) actually decide to seriously engage The Kremlin. Naturally Ukraine will see the very evident dangers of federalism with a predatory Russia. 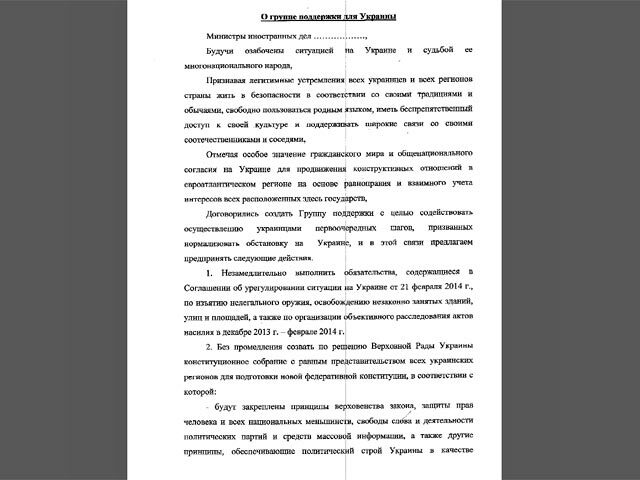 Crimean requests can be politely refused by Russia – with the Russian Black Sea Fleet assured of its place until 2042 – and joint development of the peninsula engaged upon to insure a continuing “Russian feel” and soften the secessionist disappointment. Western sanctions are suspended as swiftly upon diplomatic agreement, and Russian Visa-free negotiations put back on the EU table. These are less than cultivated ideas thrown out within a few minutes of seeing the Russian demands/opening position. Far more erudite thoughts will naturally be forthcoming. 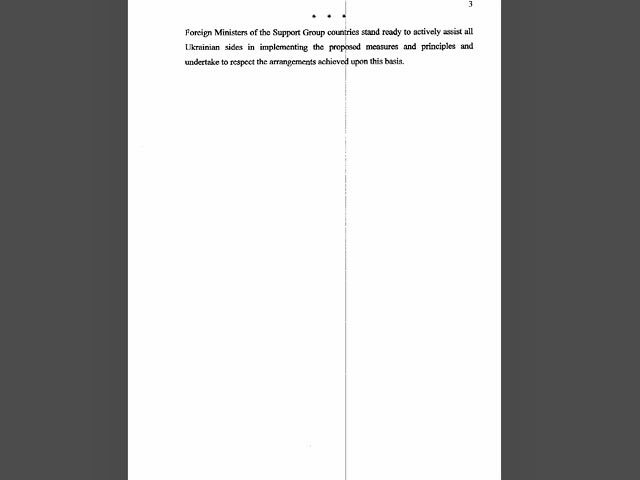 The fact that the position is now known at the very least provides the opportunity to find diplomatic solutions – though the window of opportunity for that is narrow indeed and will require a very serious and robust response from the west and the Ukrainians – and the Ukrainians (whether they do or not) must be seen to be driving that reply to find a solution – even if those solutions prove to be nothing like those I opine above. 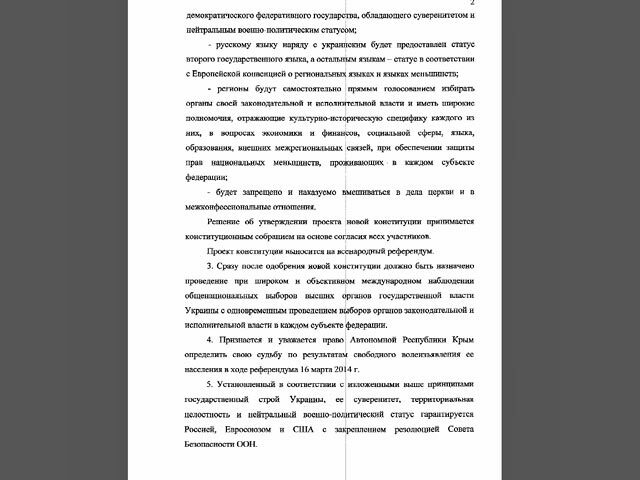 Alternatively, on 21st March the EU and Ukraine sign the Association Agreement, the Duma in response recommends Crimean accession to the Russian Federation. Mr Putin then swiftly assesses the chances of any diplomatic negotiations – particularly relating to Ukrainian neutrality becoming a globally recognised reality as being unrealistic – and welcomes Crimea on board at some point as a consolation prize for his domestic audience – that timing dependent upon how well it will interfere with the 25th May elections in concert with continued provocations in eastern Ukraine. He may simply decide to finish the job in Ukraine and to annex the bits he wants immediately, being fully prepared for the international fallout. How to get Ukrainian troops and its Black Sea Fleet out of Crimea as the current truce ends is a question I hope some are thinking about? The result of welcoming Crimea (and possibly other parts) to the Russian fold is yet another frozen conflict/disputed territorial issue upon the European continent that The Kremlin can manipulate and antagonise at will. The west and Russia enter a prolonged frosty period of relations and I am forced to refer to Crimea (and possibly other parts) as “occupied Ukraine” until a genuine and lawful referendum takes place. Global order and the sanctity of sovereign territory now something far less than robust on the continents of Europe and Asia. Parts of Kazakhstan, Serbia etc., now fear annexation by external parties – not necessarily only from Russia. Ukraine and others decide non-proliferation is not the route that offers the best security. A grim few paragraphs – Fortunately there are far brighter minds than mine that will now be working overtime to reach a diplomatic solution now knowing the Russian position and the very limited time frame. I know which I would prefer as the outcome, even if Ukraine becomes a very big Switzerland without the quality politicians to lead it – Sadly I am expecting the other, with the liberals in The Kremlin already banished to the sidelines and the siloviki clearly in the ascendancy – power projection and territorial expansion appear to be the agenda – no political, diplomatic or economic cost too high in its achievement. Time to stop thinking like a westerners and start thinking like the siloviki themselves if we are to understand their rationale. As an aside, how long before Vitkor Yanukovych recognises and legitimises the Crimean referendum for The Kremlin? When will he execute his final act lowering him into Dante’s 9th and lowest circle in hell? When does he move into his Crimean mansion? Looking forward at the domestic politics within Ukraine, will Party of Regions – should it weather the current self-inflicted political storm – ever be a majority force again if it loses such a significant voter base in Crimea to Russia? With federalism Russia no longer needs a political party vassal – stirring up regional strife and raising the prospects of secession will be enough. You are currently browsing the Odessablog's Blog blog archives for the day Tuesday, March 18th, 2014.